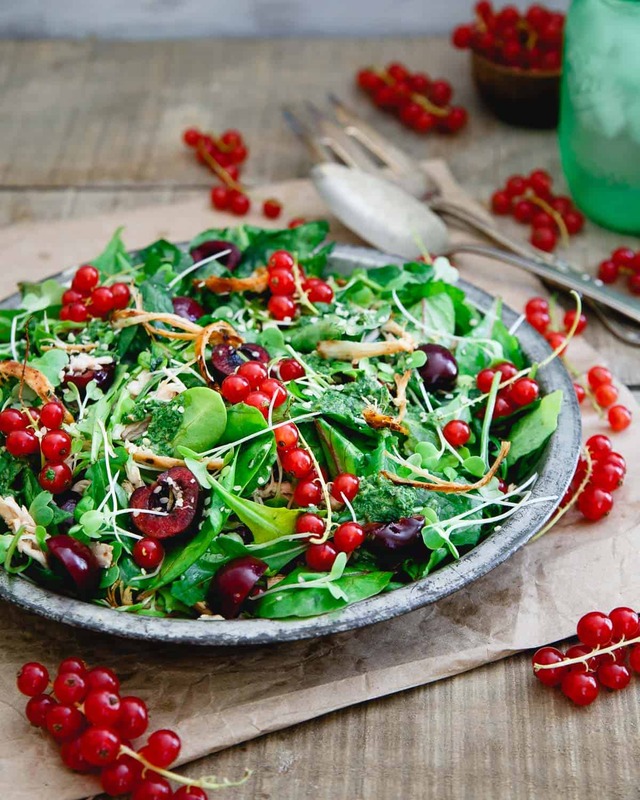 This baby kale chicken cherry salad highlights the best of summer fruit with easy shredded leftover chicken for a light and healthy meal. So while I can’t save you the 5 minutes it takes to shred that leftover chicken whether it’s from a store bought rotisserie bird you picked up on the way home from work the other day or some BBQ breast from the grill over the weekend, I’m back with my girls this month to give you six healthy recipe ideas of what to do with shredded chicken. From salads to dips to casseroles and everything in between, we’ve got you covered on how to repurpose everyone’s most common leftover! 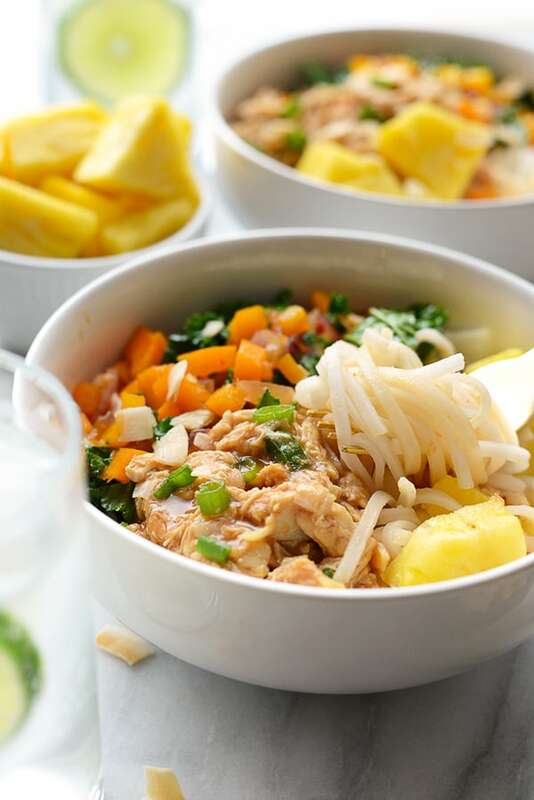 Get your meal prep on with these delicious Hawaiian Chicken Noodles Bowls made with shredded chicken, tons of veggies, and rice noodles! 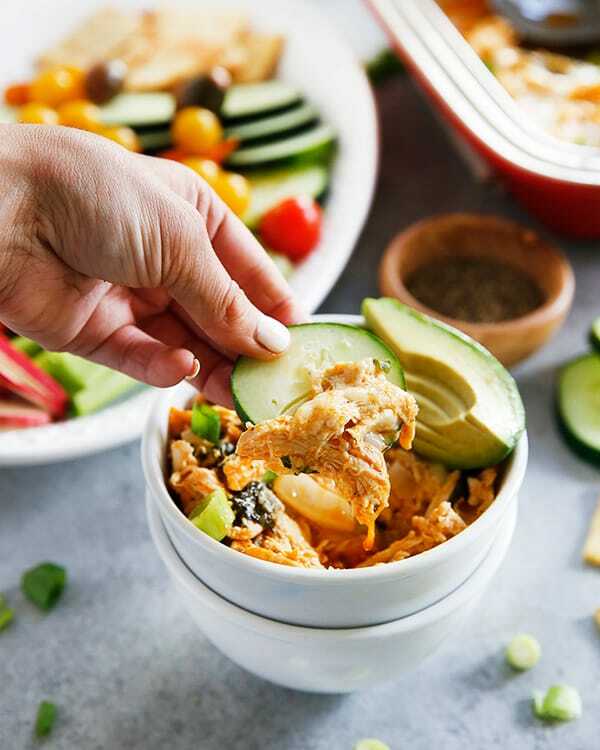 This lightened up Buffalo Chicken Dip is packed with veggies and loaded with flavor. It is the perfect cleaned up version of your favorite hearty appetizer, that can also be devoured as a main dish, too! This almond butter chicken salad skips the mayo and instead uses an almond butter and apple cider vinegar dressing! 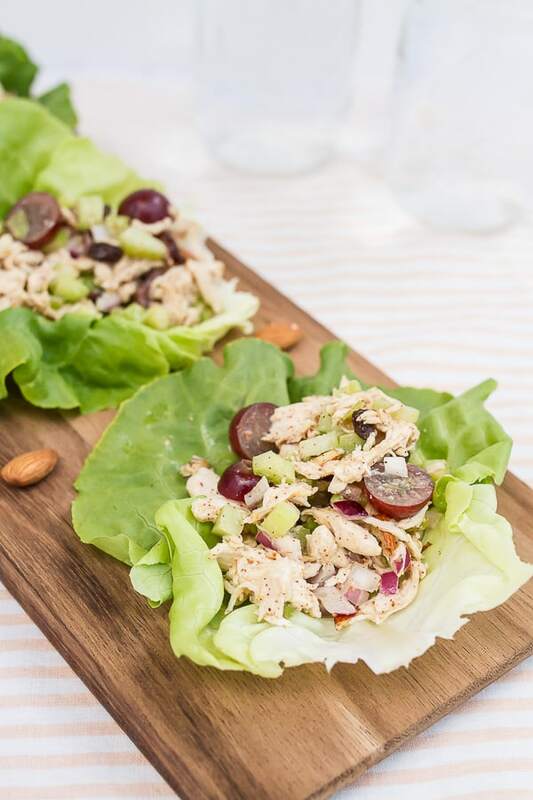 Studded with raisins, fresh grapes and chopped almonds, this chicken salad is perfect for serving in lettuce wraps or on your favorite sandwich bread. 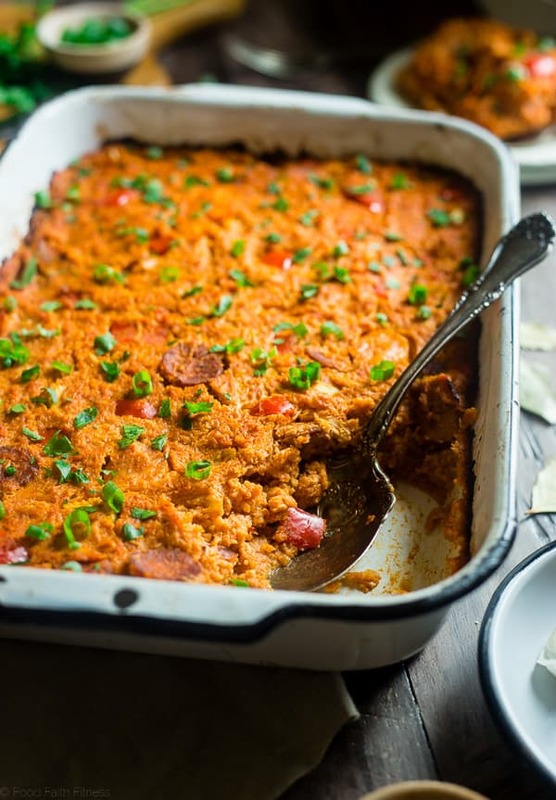 This Cajun cauliflower casserole tastes like a bowl of Jambalaya but is secretly loaded with hidden veggies and protein! It’s a gluten free, paleo-friendly meal that the whole family will love! No need for takeout with this Copycat Chipotle Chicken Burrito Bowl! 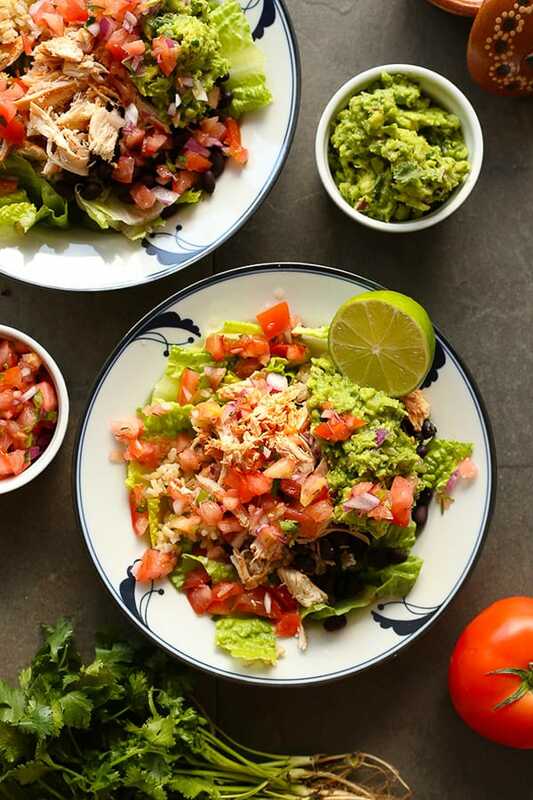 Made just like your favorite restaurant’s burrito bowl, this recipe is filling, healthy and the perfect way to use your leftover shredded chicken! If you’ve read any recent posts of mine lately (like the blackened shrimp tacos with grilled corn cherry salsa), it should come as no surprise that I just had to take advantage of the amazing summer fruit in this baby kale chicken cherry salad. 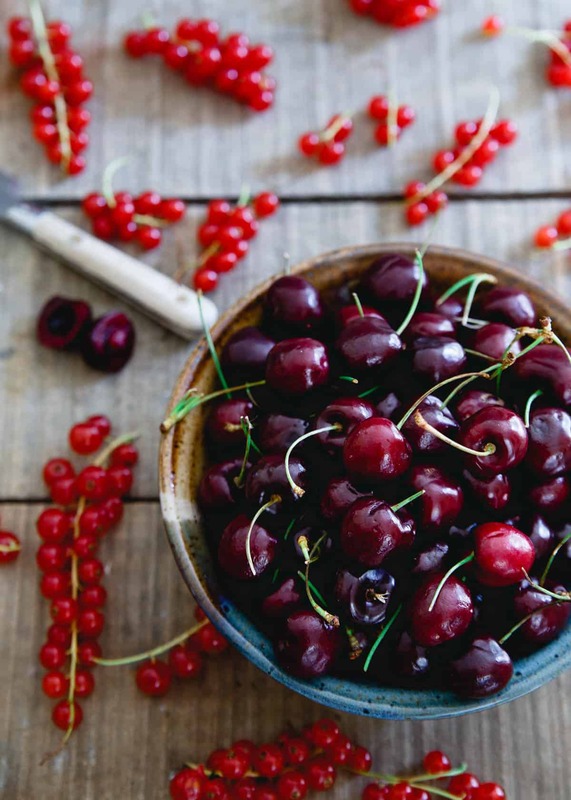 Besides the fresh cherries (which I just can’t get enough of right now), these gorgeous red currants popped up in my local grocery store and were just begging to be thrown into the mix. 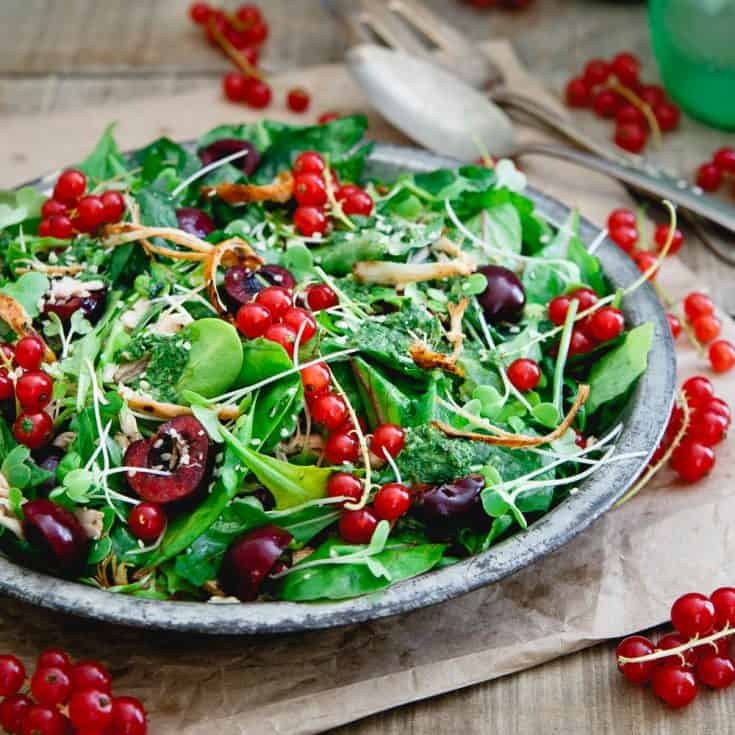 From their tart brightness to the sweeter cherry halves, this baby kale salad is bursting with summer flavor and freshness. Shredded grilled BBQ chicken breast from a few days prior gives the salad some staying power and the basil Dijon dressing just brings the whole thing together for a repurposed meal that feels anything but repurposed. Combine all the ingredients for the salad in a large bowl. Place all the ingredients for the dressing except the olive oil and water in a food processor. Process until finely chopped. With food processor running, slowly drizzle in the olive oil. Process until smooth, adding a little bit of water as necessary to thin dressing to desired consistency. Season to taste with salt and pepper. Pour the dressing into the bowl with the salad, toss gently until fully coated and serve. 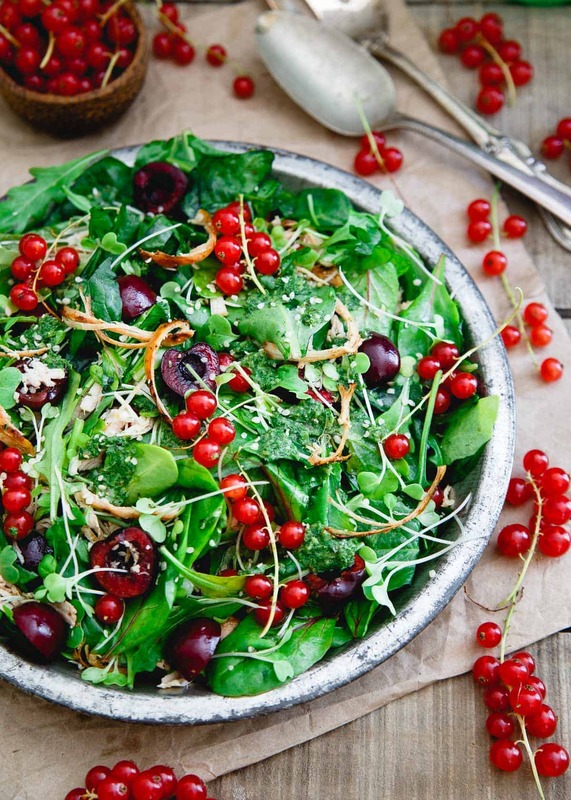 The red currants and cherries add such a nice pop of color to this gorgeous salad!! Love all the shredded chicken recipes, too! You have such a good flavor combo of ingredients and SO much texture in this salad! I love that you used cherries too -they’re SO good right now! Pinned! This salad looks absolutely amazing, what a great way to use leftover chicken!! Those colors! Gorgeous salad Gina! LOVE cherries. The cauliflower casserole looks wonderful too!